How can downtown Far Rockaway’s transportation system handle the growth in housing and commercial development that City Hall is planning for the beachside community? To hear some local bigwigs tell it, the answer is parking, parking, and more parking. But Council Member Donovan Richards has different ideas. The de Blasio administration has committed $91 million to street infrastructure, commercial development, and public services for downtown Far Rockaway in tandem with a rezoning in its affordable housing plan. At a hearing on the proposed rezoning last night, most people could only talk about one thing: parking. “The success of downtown Far Rockaway is going to be the ability to attract people from surrounding communities, including Nassau County, and they’re not going to be able to do it on [public] transportation,” said Marty Ingram, co-chair of Queens Community Board 14’s transportation committee. 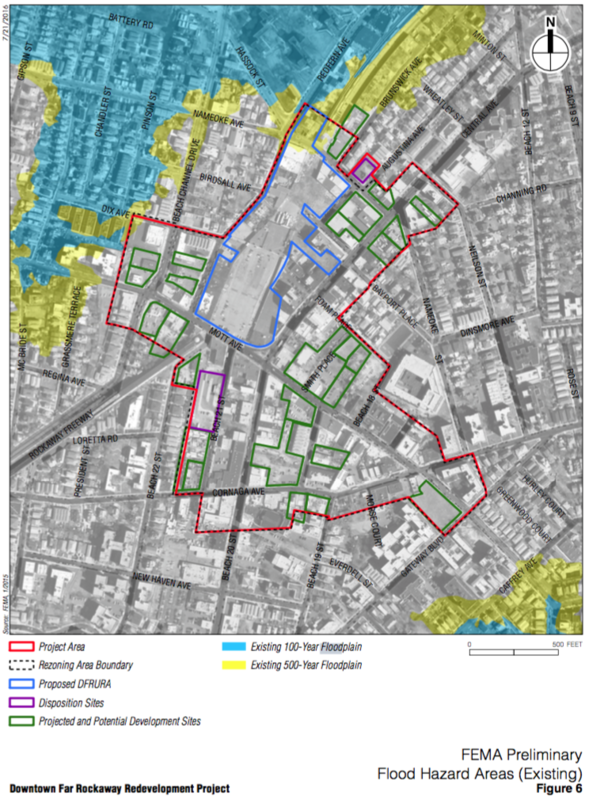 While the rezoning plan is not final, the draft environmental impact assessment anticipates lower parking requirements that “more closely reflect automobile ownership rates within the area,” which are low compared to the rest of the peninsula. Excessive parking minimums drive up the cost of housing. That was a sticking point for many other attendees, some of whom pointed to existing traffic problems as justification for more parking. Council Member Richards, who has spearheaded the rezoning process, had a different take. He said the neighborhood has a “legitimate parking issue” but that improving transit and bike infrastructure — not building more parking — is the most promising way to address those problems. “The idea is also to make sure we activate different modes of transportation,” Richards told Streetsblog. “The more transportation alternatives for everybody, the better for everyone. So bicycling, better A Train service, more SBS service. These things are paramount to ensure that this project is a success.” Richards also expressed interest in bringing Citi Bike to the neighborhood. In the spring, DOT will release initial recommendations from the “Access to Opportunity” study of the Eastern Rockaways’ transportation and housing needs. Those ideas are expected to address bus service, bike connections, and the reliability of subway and Long Island Railroad service [PDF]. Additionally, next summer the agency will begin a full reconstruction of major streets in the neighborhood. 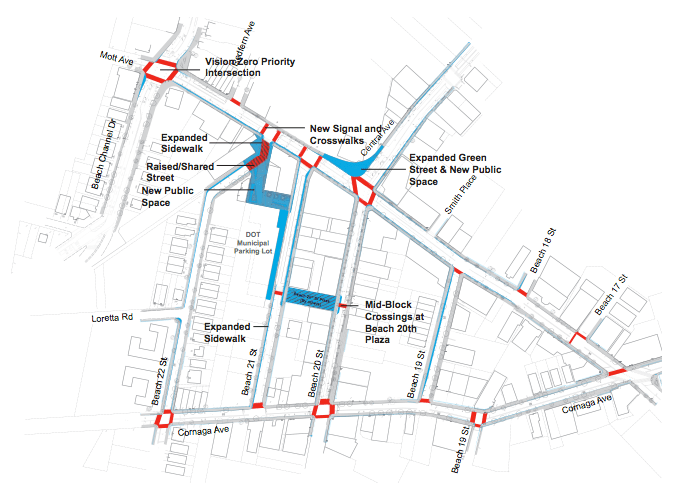 The project includes new painted crossings, expanded sidewalks, and a new plaza and “shared streets” space outside the Mott Avenue A Train station [PDF]. Absent from the initiative so far is any type of bike infrastructure. An improved bike network was among the recommendations made by a local coalition known as the Downtown Far Rockaway Working Group, but EDC’s response makes no mention of biking or bike infrastructure. Last night, several people who spoke mocked the idea of biking around downtown Far Rockaway, and the audience could be heard grumbling or laughing at the idea. One voice in favor of incorporating bike infrastructure was Daniel Solow, who bikes to the Mott Avenue A Train every day from his home in Nassau County. Did I read it right that a CB District Manager made substantive comments on a City proposal? I didn’t think it worked that way. Typically, a District Manager will comment on procedural issues, but to opine on a city proposal? No, that’s typically left to CB members for better or worse. I have a worry about climate change may result in rising sea water levels, especially starting with hurricanes. They’ll have to make provision for that, just in case. The entire Rockaway peninsula isn’t even a couple hundred years old. It came from the sea and back to the sea it will go. We would serve everyone better by buying out homeowners now. It’s a strange, sad place. Naturally beautiful, and on the edge of a huge population center. And pretty much a dump. Lindsay wanted to return the inhabited portion of Broad Channel to nature. This is the right move not only environmentally (that peninsula consists of marshland, and is properly part of a nature reserve) but also socially (the population there is a reservoir for an unspeakably foul element). The environmental justification for retreating from impermanent land applies to Rockaway as well. Instead, we are making the same mistake that New Orleans has made; we are trying to freeze in place a land formation that is naturally variable. Besides that, by its nature Rockaway helps protect the rest of NYC from the Atlantic Ocean. It can’t do that if we continually alter its form to suit development. Agreed 100% on New Orleans. We should have just let it return to nature after Katrina. There are some areas which just shouldn’t be inhabited by humans. The old timers recognized this by not building along much of the NYC waterfront. It’s a shame we’re setting ourselves up for a disaster of epic proportions when nature eventually reclaims these areas. This is a good point and normally I’d concede. But we know that sea level rise is coming – the only question is how much. (That depends on what we as humanity decide to do). We will lose broad channel with as little as 1M of sea level rise – in other words Broad Channel is doomed no matter what. Can the A train withstand that? 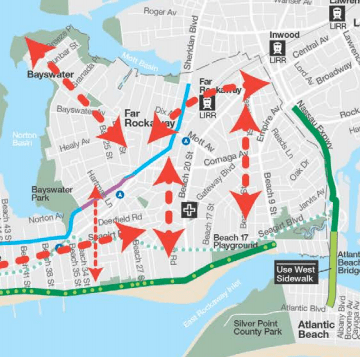 Reconnect Mott Ave to Far Rockaway and serve the Rockways from the LIRR route, which will stay above water. Not sure how I missed this story, so sorry for the late post. But it seems that those “mocking” bicycling around the Rockaways, even after Sandy, are delusional. This is an incredibly flat piece of land that should be a bicycling, and emissions-reducing, paradise.